A variety of ways of looking at scripture from a theological aspect are introduced to students so that they may interpret for themselves and use scripture in writing essays and in biblical studies. - Publisher Acknowledgements. List of Contributors. Introduction. Part I: The Contexts of Theological Interpretation: 1. Spiritual Understanding: Henri de Lubac, S. J. (French Jesuit Theologian, 1896-1991), Translated by Luke O'Neill. 2. The Superiority of Pre-Critical Exegesis: David C. Steinmetz (Duke University). 3. The Story-Shaped Church: Critical Exegesis and Theological Interpretation: George Lindbeck (Yale University). 4. Feminist Theological Hermeneutics: Canon and Christian Identity: Claudia V. Camp (Texas Christian University). 5. The Bible and African Americans: An Outline of an Interpretative History: Vincent L. Wimbush (Union Theological Seminary in New York). 6. The New Testament and the Nicene Dogma: A Contribution to the Recovery of Theological Exegesis: David S. Yeago (Lutheran Theological Southern Seminary). Part II: Theological Interpretations of Select Biblical Texts: Exodus 3: 7. Selections from Gregory of Nyssa's Life of Moses: Translated and introduced by Joseph W. Trigg (Rector, Christ Church, Port Tobacco Parish, La Plata, Maryland). 8. Selections from Nicholas of Lyra's Commentary on Exodus: Translated and introduced by Corrine Patton (University of St Thomas).9. Three Postcritical Encounters with the Burning Bush: Peter Ochs. 10. Exodus 3: A Theological Interpretation: Terence E. Fretheim (Luther Northwestern Theological Seminary). 11. Exodus 3: Summons to Holy Transformation: Walter Brueggemann (Columbia Theological Seminary). Isaiah 52-53: 12. Selections from Theodoret of Cyrus's Commentary on Isaiah: Translated and introduced by Angela Russell Christman (Loyola College, Maryland). 13. Selections from John Calvin's Sermons on Isaiah: Translated and introduced by Kathryn Greene-McCreight (Yale College). 14. Speech and Silence in the Servant Passages: Towards a Final-Form Reading of the Book of Isaiah: Tod Linafelt (Georgetown University). 15. Selections from I, He, We, They: A Literary Approach to Isaiah 53: David J. A. Clines (University of Sheffield). 16. Engaging Metaphors: Suffering with Zion and the Servant in Isaiah 52-53: Beverly J. Stratton (Augsburg College). Matthew 5-7: 17. Selections from John Chrysostom's Homilies on Matthew: Translated and Introduced by Robin Darling Young (The Catholic University of America). 18. Selections from Martin Luther's Sermons on the Sermon on the Mount: Translated and Introduced by Mark S. Burrows (Andover Newton Theological School). 19. Righteousness from the Inside: The Transformative Spirituality of the Sermon on the Mount: Brian K. Blount (Princeton Theological Seminary). 20. Selections from The Cost of Discipleship: Dietrich Bonhoeffer (Theologian, Pastor in the Confessing Church in Germany, Martyr, 1906-45). 21. The Sermon on the Mount as Radical Pastoral Care: Richard Lischer (Duke University). Romans 9-11: 22. 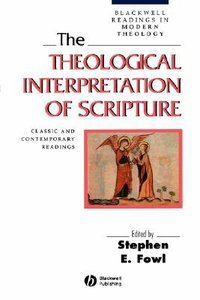 Selections from Augustine's Propositions from the Epistle to the Romans and To Simplician - on Various Questions: Introduced by Peter Gorday (Georgia Association for Pastoral Care). 23. Selections from Thomas Aquinas's Commentary on Romans: Translated and Introduced by Eugene F. Rogers, Jr. (University of Virginia). 24. Romans 10:4 and the 'End' of the Law: Paul W. Meyer (Princeton Theological Seminary). 25. Divine Initiative and Human Response: E. Elizabeth Johnson (New Brunswick Theological Seminary). 26. Figure and Ground in the Interpretation of Romans 9-11: Neil Elliott (The College of St Katherine). Index. - Publisher This book introduces students to the practice of reading scripture theologically and shows how explicitly theological concerns can be brought to bear on the interpretation of scripture. While the volume offers some methodological essays, it does not lay out a single method; it points to the variety of questions that can and have been raised about interpreting scripture theologically. About "The Theological Interpretation of Scripture"
Acknowledgements. List of Contributors. Introduction. Part I: The Contexts of Theological Interpretation: 1. Spiritual Understanding: Henri de Lubac, S. J. (French Jesuit Theologian, 1896-1991), Translated by Luke O'Neill. 2. The Superiority of Pre-Critical Exegesis: David C. Steinmetz (Duke University). 3. The Story-Shaped Church: Critical Exegesis and Theological Interpretation: George Lindbeck (Yale University). 4. Feminist Theological Hermeneutics: Canon and Christian Identity: Claudia V. Camp (Texas Christian University). 5. The Bible and African Americans: An Outline of an Interpretative History: Vincent L. Wimbush (Union Theological Seminary in New York). 6. The New Testament and the Nicene Dogma: A Contribution to the Recovery of Theological Exegesis: David S. Yeago (Lutheran Theological Southern Seminary). Part II: Theological Interpretations of Select Biblical Texts: Exodus 3: 7. Selections from Gregory of Nyssa's Life of Moses: Translated and introduced by Joseph W. Trigg (Rector, Christ Church, Port Tobacco Parish, La Plata, Maryland). 8. Selections from Nicholas of Lyra's Commentary on Exodus: Translated and introduced by Corrine Patton (University of St Thomas).9. Three Postcritical Encounters with the Burning Bush: Peter Ochs. 10. Exodus 3: A Theological Interpretation: Terence E. Fretheim (Luther Northwestern Theological Seminary). 11. Exodus 3: Summons to Holy Transformation: Walter Brueggemann (Columbia Theological Seminary). Isaiah 52-53: 12. Selections from Theodoret of Cyrus's Commentary on Isaiah: Translated and introduced by Angela Russell Christman (Loyola College, Maryland). 13. Selections from John Calvin's Sermons on Isaiah: Translated and introduced by Kathryn Greene-McCreight (Yale College). 14. Speech and Silence in the Servant Passages: Towards a Final-Form Reading of the Book of Isaiah: Tod Linafelt (Georgetown University). 15. Selections from I, He, We, They: A Literary Approach to Isaiah 53: David J. A. Clines (University of Sheffield). 16. Engaging Metaphors: Suffering with Zion and the Servant in Isaiah 52-53: Beverly J. Stratton (Augsburg College). Matthew 5-7: 17. Selections from John Chrysostom's Homilies on Matthew: Translated and Introduced by Robin Darling Young (The Catholic University of America). 18. Selections from Martin Luther's Sermons on the Sermon on the Mount: Translated and Introduced by Mark S. Burrows (Andover Newton Theological School). 19. Righteousness from the Inside: The Transformative Spirituality of the Sermon on the Mount: Brian K. Blount (Princeton Theological Seminary). 20. Selections from The Cost of Discipleship: Dietrich Bonhoeffer (Theologian, Pastor in the Confessing Church in Germany, Martyr, 1906-45). 21. The Sermon on the Mount as Radical Pastoral Care: Richard Lischer (Duke University). Romans 9-11: 22. Selections from Augustine's Propositions from the Epistle to the Romans and To Simplician - on Various Questions: Introduced by Peter Gorday (Georgia Association for Pastoral Care). 23. Selections from Thomas Aquinas's Commentary on Romans: Translated and Introduced by Eugene F. Rogers, Jr. (University of Virginia). 24. Romans 10:4 and the 'End' of the Law: Paul W. Meyer (Princeton Theological Seminary). 25. Divine Initiative and Human Response: E. Elizabeth Johnson (New Brunswick Theological Seminary). 26. Figure and Ground in the Interpretation of Romans 9-11: Neil Elliott (The College of St Katherine). Index. This book introduces students to the practice of reading scripture theologically and shows how explicitly theological concerns can be brought to bear on the interpretation of scripture. While the volume offers some methodological essays, it does not lay out a single method; it points to the variety of questions that can and have been raised about interpreting scripture theologically. Stephen E. Fowl is Associate Professor in the Department of Theology at Loyola College in Maryland. His previous books include "The Story of Christ in the Ethics of Paul" and "Reading in Communion" (with L. Gregory Jones). He has published numerous articles in both biblical studies and ethics, and from 1990-95 was co-editor of "Modern Theology,"
Aquinas (introduced By Gene Rogers), Paul Meyer Et Al.